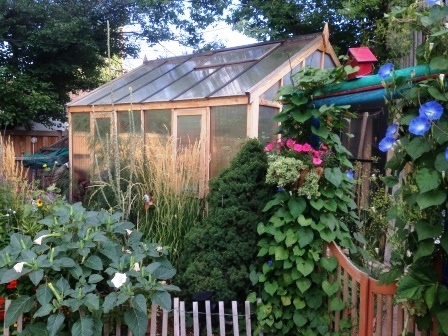 Many of the materials you’ll use in a greenhouse have different, noteworthy characteristics. This section might come in handy when you are working with retrofitting, or constructing greenhouses. Remember a greenhouse glazing is only as good as its warranty! First, before you buy glazing material, be sure that it is sold specifically for use in the sun over many years without losing its clarity (at least for a good while). Virtually all plastics eventually break down (either turn yellow, white and/or become brittle) when exposed to the sun’s ultraviolet light, limiting the amount and quality of light entering the greenhouse. Still that is no reason to not choose plastic. Some are guaranteed for as much as 20 years (however most are about 10 years). Some plastics are many times stronger than glass. Where I live it hails on the average of 10 times a year. Glass is not an option. For our specific climate and budget I choose polycarbonate. There are many pros and cons to consider in selecting the right glazing. Usually the number one consideration is budget. One of the most important questions is the warranty or guarantee, get a copy of it and read it before you buy. Let’s look at some of the attributes of different glazings. 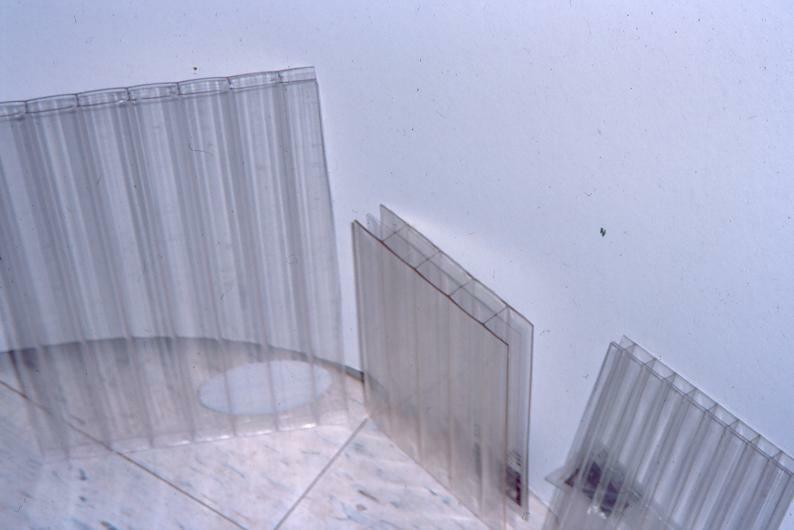 Acrylic– Available as a double walled material. Acrylic is very strong but is easy to cut. May support an open flame. Expands and contracts with temperature swings. Often acrylic is a clear material or even clearer than polycarbonate, however like most plastics it is easily scratched (easier than polycarbonate). It is moderately expensive as a single sheet. If you start to get multiple layer honeycomb types of sheets the price rises rapidly. It can bend around large diameter curves. Some acrylics readily crack when hit with a blunt object such as a large hailstone. The life span of most acrylics are usually from 10 to 20 years, check the warranty. It is more resistant to yellowing than most plastics but still gets brittle with age. Fiberglass– Commonly found in many brands and grades. Life span varies from 3 years to 20 years. Some brands turn yellow quicker than others. 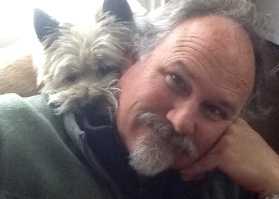 Be careful of what is sold in lumberyards; trust in only the written warranty. Fiberglass is very combustible! I would rate it as being moderately cheap. It is available in both corrugated and flat. Fiberglass glazing is only available in single-layer thickness. Often used in concert with polyethylene placed on the interior providing a low cost second, inner layer for insulation. Fiberglass is easy to cut and easy to work with. Be sure to wear gloves as the fibers can irritate. Fiberglass is relatively strong but can be bent around large diameter curves. It has a low amount of expansion and contraction with varying temperatures. Fiberglass is great for diffusing light which increases photosynthesis in a greenhouse. Glass– Commonly available. This is the only glazing that I can think of that is recyclable. It varies in price from cheap (double strength) to expensive if it has many energy saving treatments. Glass is brittle and difficult to cut. It requires more precision and muscle in the installation process, as it can be heavy to work with. All of this may increase the installation price. Glass is available in single, double and triple layers for maximum energy efficiency. It is also available as a tempered or laminated glass product for increased strength. The life span of glass can be indefinite (until a rock or hail stone attack). There have been and will continue to be many new energy conserving technological advances with glass making some glass brands very energy efficient. These include low-e, heat mirror, argon-filled air spaces and more. The effects of these new innovations in glass technology on the growing of plants remains to be fully tested. In general these surface treatments usually grow plants fine except when they noticeably darken the glass which reduces the amount of incoming light. Some pluses to glass include the fact that glass has a very low amount of expansion and contraction with varying temperatures. Unlike many plastics, glass is not combustible, nor does it scratch. Clear glass creates sharp shadows and does not diffuse light much. This is less optimal for growing plants but is great if you want to look out of your greenhouse. You can also find glass that has been treated with a frost-like application that can diffuse light very well. (see related in depth discussions on diffuse light and plant growth later in the book Greenhouse Gardener’s Companion. Finally, glass is heavier than most plastics and requires a beefier frame to support it. Conversely, plastic glazings require a less sturdy frame for support (but be sure to think about snow load). Polycarbonate– This material is becoming more common. It is now found in lumberyards. Available in single, double (usually 8mm thick) and triple layers for maximum energy efficiency (available in varying thicknesses most commonly 8 and 16mm thick). The more layers it has, the better the insulation and the higher the price. I would classify the price of single and double polycarb as moderate given its life span. Triple thick can get pricier. While polycarbonate is very strong it is easy to cut with a saw. Life span is around 10 to 15 years although you may see yellowing as soon as 10 years. Most warranties are pro-rated for 10 years, and some even include replacement coverage against hail. Polycarbonate does not support a flame. Condensation can be a problem with the multiple layered materials in the interior channels. Some manufacturers are treating some of the surfaces with chemicals which minimizes visible condensation. The double and triple thick materials are great for diffusing light increasing photosynthesis. Polyethylene films– This includes many brands, which have varying thickness, qualities and life spans. You get what you pay for. Life span is from less than 1 year to 5. Only single layer films are available but commercial growers often set up a system with two layers of polyethylene and inflate an airspace in between (with a small squirrel cage fan), providing an insulating quality. Some films hold in long wave (infrared) radiation better than others. This allows the glazing to retain more solar heat. There is a woven polyethylene available which is tougher for windy situations. I have heard some good reports on the woven poly from people who need a cheap 3 to 4-year glazing material. Again, it all depends upon the warranty. Rigid polyethylene– this material is only available as a twin-wall product that looks similar to twin-wall polycarbonate. It is most often compared to polycarbonate. It is a bit softer, usually has an 8 year warranty, a lower light transmission than twin-wall polycarbonate (75%). It has less clarity (with a whitish look) which diffuses light (good for plants) and may lower the indoor temps a bit. In low light cloudy areas you may be wishing of more clarity and light. Because rigid polyethylene is softer, it can be rolled up for shipping which lowers the shipping price (it is also available in pre-cut panels) This, on top of the fact that the material is also cheaper than polycarbonate makes it an economical choice to consider if you are o.k. with less light a slightly less warranted life span. This material is primarily sold as “Solexx” . “R-value” is a commonly used term to measure a material’s energy conserving (or insulating) properties. It is a measure of resistance that a material has to the flow of heat. The below R-values reflect real world outdoor situations. 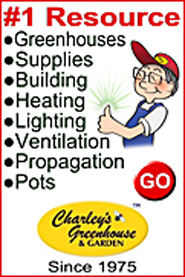 Specific brand-name products may vary from these figures. It is always good to check on the stated R-value of a product as you evaluate a glazing. Also, consider other important attributes when evaluating glazings or insulation materials (see discussion in chapter 1). The more energy conserving a material is, the higher its R-value. Note: The term R-Value is a common measure of insulation (hr°Fsq.ft/BTU). Note: You may also find products sold with a U-value instead of an R-value. A U-value is the inverse of an R-value. To convert a U-value to an R-value do the following: 1 divided by the U-value equals the R-value. For example: fiberglass has a U-value of 1.20 when it is divided into 1 it equals a .83 R-value. © copyright 2000, 2015 Reproduction or printing of material from this web site is prohibited. 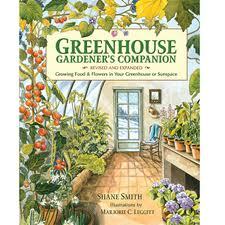 This material is excerpted from the book Greenhouse Gardener’s Companion by Shane Smith.